The NHDB has added a new format to the eBook collection! The Open EPUB format is a type of eBook that does not contain DRM (Digital Rights Management). At this time there are just a few publishers selling eBooks to libraries without DRM, so a majority of our eBooks still contain DRM. 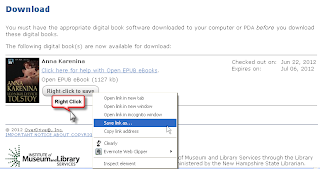 The Open EPUB eBooks will work on any eBook reader, tablet, or smart phone that can currently use the Adobe EPUB titles. 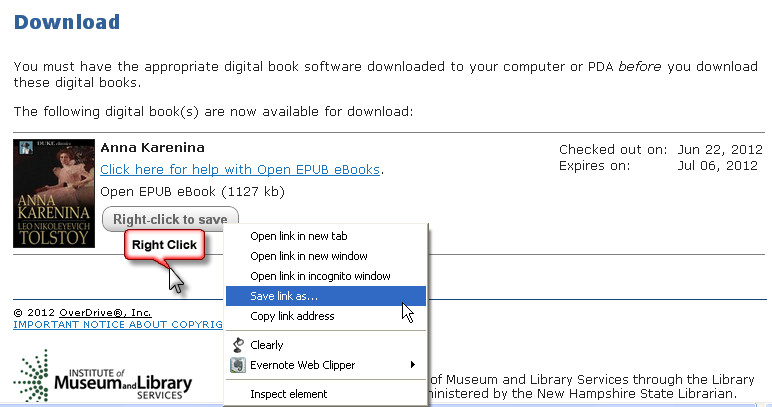 Unlike the Adobe EPUB eBooks, the Open EPUB eBooks cannot be returned to the collection early. To find the small collection of Open EPUB titles, use the Advanced Search, and select the "Open EPUB eBook" as the format. Browsing for and checking out the Open EPUB titles are similar to finding and checking out any other format in our collection. Find a title, add the Open EPUB format into your cart, proceed to checkout, and confirm your checkout. 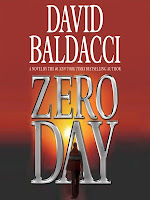 Nook and Kobo users: Find the file on your computer and double-click the file to open it with your previously-installed Adobe Digital Editions. Transfer as normal. Sony Reader users: Find the file on your computer and double-click the file to open it with your previously-installed Sony Reader Library. Transfer as normal. 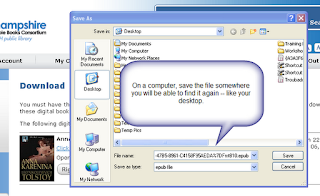 If you checked out and downloaded the file using your computer, you can email the file to yourself and open it with your tablet or smart phone. Normally, when you view the email on your smart phone or tablet, you’ll tap on the attachment to open it. By default, Apple devices open EPUB with the iBooks app; however, you can choose other program like the OverDrive Media Console app or the Bluefire Reader app, etc. – anything you have installed that can open EPUB. Open your mobile browser, visit the NHDB site, and use the “Browse” button to browse Open EPUB titles. Check out the title as normal, and press the “Download” button. Open the file in the desired application and start reading!